Well, I am grateful for all the super laughs I got from that statue. She was an incredibly talented, very popular actress. While the I Love Lucy shows are what she's best known as doing, she made some great films, from the 30's onward, not all of them comedies. 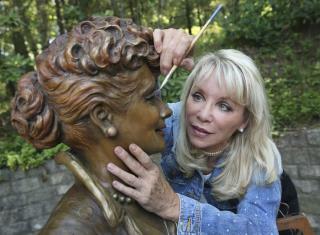 When I first saw photos of that "scary Lucy" statue, I was appalled. It didn't look anything like her. You have to wonder why it was cast, since a model had to be made. Didn't anyone look at the model for the mold? Anyway, the new statue is nice. If Hollywood had realized Lucille Ball's enormous talent as a physical comedian they would have cast her in a sting of screwball comedies that today we'd watch on TCM and lead us to say "whatever happened to her". Instead she made her own way and gave us the gold that we have to enjpy. Salute to Lucille Ball.